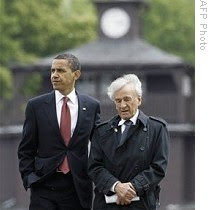 Elie Wiesel is a wonderful man. A survivor of the Holocaust, the event that defined him and millions more, Wiesel has more toughness in a hangnail than most of us have in our entire bodies. So it is that his mood after a recent lunch with Barack Obama leaves me saddened. Wiesel believes that U.S.-Israel relations are okay again after a recent spat, in which Obama bared his fangs over Jewish homes being built in east Jerusalem. This is pretentious speculating on my part, but I believe that certain Jews — I consider them to be the most noble people on the planet — are so puzzled by hatred toward their people, that they look for the good wherever they can find it. Problem for Wiesel is, anti-Semites don’t embody “good.” And this is a theological tangent, but the concept of human “good” is not supported by the Bible. The fallout from the Fall in Genesis produced a human race tainted by pride and selfishness, qualities that are accelerating in their impact, in our day. Elie Wiesel, a phoenix who rose from the literal ashes of the Holocaust, still had no clue what he was dealing with during his luncheon with the young fox, Obama. The former is a symbol of whatever good man has possessed in his tortured time on Earth; the latter is a deeply antagonistic foe of Israel. Let me say this clearly: Obama, as a narcissist, has no one’s best interests at heart. To think that he would go out on a limb and support Israel in any way — in a world reeling from the virus of anti-Semitism — is ludicrous. In fact, he does the opposite. Obama’s anti-Israel attitude is deep and abiding. The sooner supporters of Israel internalize that, the sooner we can formulate plausible action plans to deal with the reality. Jew-haters are wolves who, from time to time, lay back their ears and whine softly, like some helpless animal. Their malevolence only manifests itself when it’s too late for the victim to react to the reality. Take the various “peace” initiatives tossed out by past U.S. administrations. After the Six Day War, most people weren’t aware that a multitude of peace proposals were tossed-out by the Israelis, to the Arabs. The U.S. always latched onto these and amplified them, like an obnoxious smart kid in a class of equals. After a decade of Arab nastiness, the Israelis began settling the biblical heartland, a fact I never tire of mulling over. How delicious that man’s pride, this time in the form of Arab arrogance, has served as the catalyst for biblical prophecy to be fulfilled! Lyndon Johnson’s administration understood that UN Resolution 242, which called for Israel to return “territories,” not “the” territories, could serve as a peace settlement. Needles to say, and this is key to understanding the Arab and Iranian mindset, nothing short of all of the land will satisfy. The Arabs literally want to see all of Israel disappear. Richard Nixon was no Jew-lover, but he did send planeloads of military hardware to Israel at the height of the Yom Kippur War. Jimmy Carter, in his maliciousness, sought to bring Israel to her knees by strong-arming Menachem Begin at Camp David. Begin did agree to turn over the Sinai to Egypt. Would that the Israelis had kept the peninsula! Carter, who one day will answer for his grotesque dislike of the Jewish state, continues to this day to be a crown of thorns in the side of the Israelis. As a pious Christian who loves to demonize Israel, Carter is probably unaware just how he is perceived by Jews, who have a long and bloody history at the hands of the Christians. Carter’s pious, Sunday school teaching and smarmy books that masquerade under the banner of humanitarian initiatives will not be a shield on Judgment Day. Even Ronald Reagan recognized the PLO and sowed the seeds for the Palestinian Authority to emerge, with the help of the George H.W. Bush administration, a real foe of Israel, let me tell you. Bill Clinton knew perfectly well what Arafat and the PLO/PA were up to, but he didn’t care. Another narcissist, he fancied himself as a Nobel Prize winner and if that meant squeezing Israel and hating Bibi Netanyahu, well, that’s what he’d do. Obama is the latest Oval Office occupant to walk the same well-worn path. I would bet a million dollars that if he were confronted with the biblical promises to the Jews, in private, he would laugh. I guarantee it. For him, the Bible is as supernatural and relevant as an old copy of Look magazine. His team of Marxists and socialists are in actual fact ideologically aligned with the old PLO in ways most of us will never understand. So it painfully goes with American interference. Weekly, our government issues inane, repetitive statements about the Middle East. Hillary Clinton urges Arabs to tone-down the rhetoric. Barack Obama urges “the two sides” to sit down in sincere efforts for peace. Meanwhile, the jihadists build their garrison, brick-by-brick. Two dates in 1994 stand out as dark days for real peace efforts. The Gaza-Jericho agreement of May 4, and the Transfer of Power (from Israel to the PLO/PA) of August 29 are permanent stains on the history of the United States, for our involvement in bringing them about. The idea that a republic, founded on principles of freedom and safety for its civilians, would knowingly hand over parts of Israel’s biblical homeland to a killing machine like Yasser Arafat is impossible to process. Those two 1994 agreements were a prelude to Arafat riding triumphant into Gaza and Jericho, a powerful symbol to the jihadists he led until his overdue death in 2004. Those of us who watch the Arab-Israel “peace” process closely see a constant drumbeat of mind-numbing repetitiveness. Are Western interlocuters simply naïve, or is there some malevolent method behind the madness? For my part, I shout it is the latter. People like Obama, with their urbane manner and education, are too smart not to know what’s going on. Take for example, the pattern of slapping Syria’s hand, then holding onto it like Liberace greeting a young male model. Syria has always been our enemy and always will be. The government hates Americans, hates Israel, and engages in mischief constantly. As the Iraq war began in 2003, the Americans knew Syria was smuggling weapons to Iraqi terrorists. The Syrians have provided logistical aid and more to Hezbollah, the terrorist group responsible for, among other things, the bombing of the U.S. Marine barracks in Beirut in 1983. In April, 1986, terrorist Nizar Hindawi attempted to blow up an Israeli El Al plane in London. He was caught hiding in the home of an attaché with the Syrian embassy! Bashar Assad, a thug in an expensive suit, replaced his thankfully dead father and in 2002 took the opportunity to upbraid the elderly pope with a classic anti-Semitic theme revolving around how the Jews allegedly killed Christ. The old man, in a shriveled body but with a clear mind, sat there and took it. In a superb book that I highly recommend for lay audiences wanting to familiarize themselves with the complexities of the Middle East, author Yitschak Ben Gad provides fascinating detail into the various failed peace initiatives that have sucked-up American taxpayer money and oceans of energy. Ben Gad’s The Roadmap to Nowhere details such frustrating failures as the Wye River Memorandum of 1998, in which Clinton squeezed Netanyahu to help out Arafat. Point Four of the memorandum, as just one example, required the Palestinians to apprehend terrorists planning attacks on Israelis. Seriously, can’t you just see the Palestinians holding themselves, then exploding in laughter when everyone else left the room? The Roadmap to Nowhere is invaluable, if one wishes to understand the background of the region, and understand the players and motivations of said players. I refer to it again and again. Chapter Seven — “America As Mideast Broker” — is worth the price of the book. The Arabs, the State Department, the British Foreign Office, CNN, Preterists, and many others may think they are right about Israel. I know that they are not, and you know it, too. The nations may rage, but one day they will gasp and beg Israel’s forgiveness.